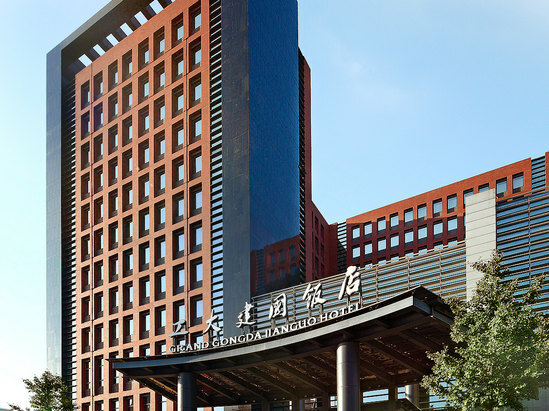 Grand Gongda Jianguo Hotel is located a 12-minute drive from China World Trade Center and Guomao Commercial Area. The stylish hotel offers a health club, free parking and free internet. Spacious guest rooms at Grand Gongda Jianguo are fully air conditioned and feature a modern interior. Each well-furnished room has an electric teakettle, ironing facilities and a flat-screen TV with cable channels. Hotel Grand Gongda Jianguo has a well-equipped fitness center. Laundry and dry cleaning services are offered. The hotel has a tour desk to assist guests with travel arrangements and ticketing. Fu Yuan Cafe serves a wide variety of international and Asian dishes. Japanese and Chinese food can be tasted at Wan Shi Chuan Japanese Restaurant and Tainan Fu Cheng Chinese Restaurant respectively. Grand Gongda Jianguo Hotel is a 10-minute drive from the Antique Market. It is 27 miles from Beijing Capital Airport and will take around 40-50 minutes by taxi.